Have your PC already become smarter than you? If it hasn't, you just need to wait a little bit. According to Gartner's agency forecast, artificial intelligence will surpass human intelligence in several times by 2029. We already use virtual assistants in our phones, chatbots and other tools that augment our life and make it more convenient. So software development with neural networks integration can be the real way to make your app advantageous. First, let's take tools that stand for machine learning. There are some of them that we need to pay attention to. This platform is a cloud solution that allows developers to build and use complicated models of machine learning in a simple and clear way. Also, it is an eco-system developed for distribution and monetization of ready-made algorithms. 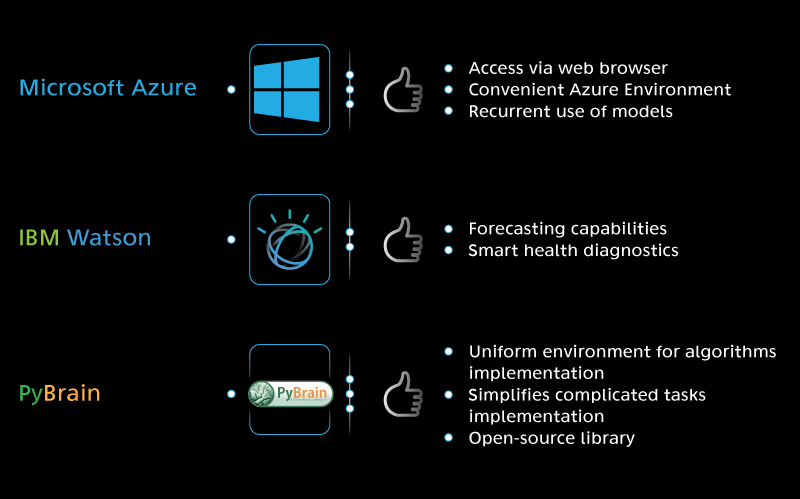 Azure Machine Learning is the Microsoft product and today it is one of the most easy-to-use tools for machine learning deployment. Everybody can handle it without any obstacles. Using Azure ML, developers and analysts can quickly build and integrate solutions for customers' service improvement, forecasts, and preventions of equipment malfunctions, fraud prevention, as well as other tasks implementation. Searching and recurrent use of models, the capability of using different machine learning algorithms and modeling strategies quickly and contemporaneously. This is a whole cognitive system that is able to learn, understand and draw conclusions. It also allows people to transform different fields of science and technics. For instance, it can forecast epidemics, natural disasters in various regions, monitor atmosphere condition, optimize business processes etc. IBM created its supercomputer of the same name. Based on this cloud API platform, there are different apps, services and processes being developed. Other developers that want to use IBM Watson may use APIs available on IBM website. Watson contains almost 50 APIs at the moment. See why AI can prevent frauds from infecting your software. Read How can machine learning protect your fintech app from frauds? IBM Watson benefits are really limitless. Today scientists try to use all capabilities of the system for forecasting earthquakes or volcanic eruptions. Businessmen optimize commodity flow and figure out what will be in trend among customers in the nearest future. Physicians use Watson to diagnose diseases. On IBM Watson basis people create apps and services that simplify work and make life more comfortable. Any developer can create his or her own service using Watson. It is one of the best Python libraries for learning and implementation of a lot of various algorithms related to neural networks. It is a combination of a compact syntax of Python with a good implementation of a large set of algorithms for machine intelligence. It is an open-source AI library, so developers are welcome. Scikit-Learn is a powerful tool for machine learning tasks solution that is developed as a package for Python language. It allows developers to solve many tasks that require data processing, classification and clustering tasks. It is a perfect alternative to use it for data mining, visualization of data, analysis and so on. It is easy-to-use due to a simple syntax of Python. It is a neural network library created by Google that learns to solve tasks by enhancing and processing of data in different nodes that makes it possible to find a correct result. A machine learning library offers developers to use APIs for Python and C/C++ languages that can connect to the developer's software. Good for deep learning as well. Torch is the library for scientific calculations with a wide support of machine learning algorithms. The library consists of modules set where each module is responsible for different stages of working with neural networks. For example, one module is responsible for neural network configuration, other module helps optimize learning process etc. It is possible to install additional modules to extend library's functionality. 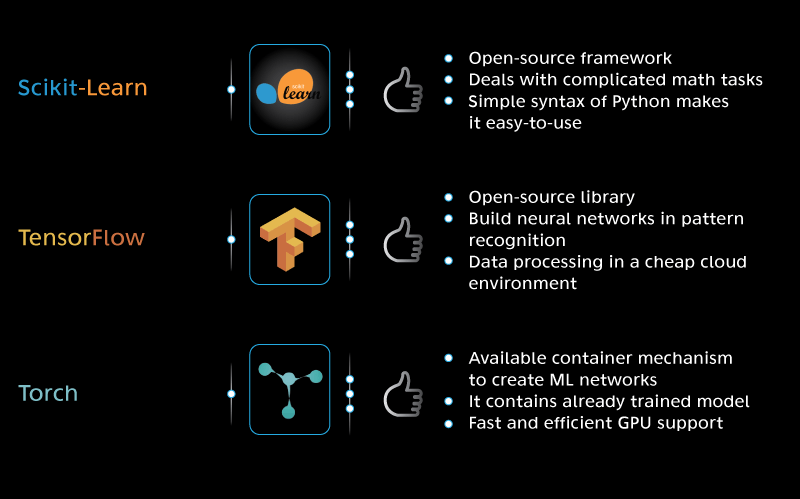 Torch can be regarded as one of the best machine learning library. Torch makes it possible to create complicated ML networks using containers mechanism. The container is the class that combines neural networks components into one general configuration. The library is developed on Lua language, and it is used by giants like Facebook and Twitter. Also, it contains already trained models. Deep learning is the class of machine learning and it is a subset of machine learning. It uses neural networks that can imitate decisions making by humans. This type of learning is much deeper and more complicated. So let's take a look at tools for deep learning. Caffe framework is created for commercial use in the first turn. At the same time, it is an open-source, it is written in C++ language, and it allows to write user algorithms in Python. Caffe offers you a wide toolkit for the development and deployment of modern deep learning algorithms. Today Caffe is successfully used for speech and images recognition in different fields including fields like astronomy and robotics. There are available models of learning that are already integrated into the system. High performance makes Caffe a perfect tool for commercial use. Today Caffe is the leader in the top of artificial intelligence framework for deep learning. CNTK is a Computational Network Toolkit from Microsoft with deep learning algorithms. The toolkit is used in speech recognition services predominantly, such as Windows Cortana, Skype Translator etc. The toolkit can also be used for automated translation and image recognition tasks resolution. It is developed in C++ language. CNTK allows developers to create distributed neural networks made in the form of the oriented graph. CNTK supports different models of neural networks - feed-forward, convolutional, recurrent neural networks as well as their combinations. CNTK is using mostly GPU for calculations and provides with linear scalability. Learn more about AI advantages to use it in business. Read How business can grow using neural network advantages? An open-source distributed library for deep learning. It is created for Java and Scala programming languages. It was developed for business apps and integrated with Hadoop and Spark. DeepLearning4J is functioning in Java Virtual Machine. It can work with huge data without any problems. 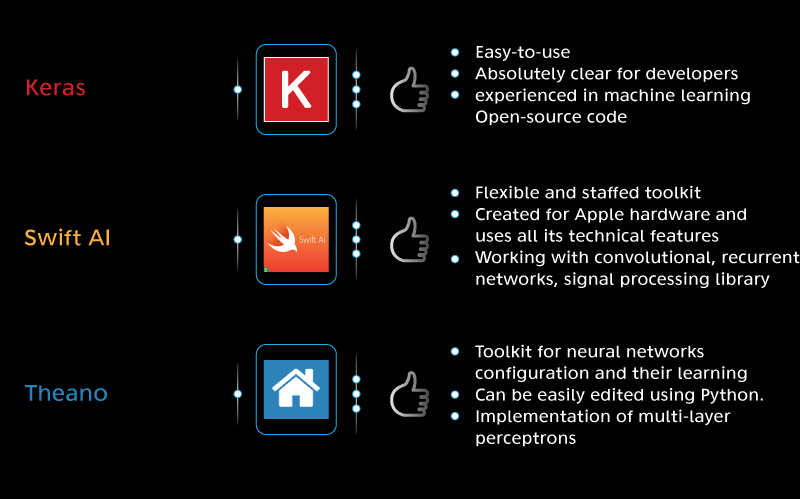 Keras represents the library that can work with neural networks on a higher level. It simplifies many tasks, it is used in quick experiments and decreases the amount of the same code. Keras is used on convolutional and recurrent neural networks, and on CPU and GPU. Deep learning library that is created directly for Swift for its use on Mac computers. But Swift AI developer promise that Linux version will be available soon as well. Using Swift AI, developers can create neural networks together with deep learning algorithms. It is used predominantly in written speech recognition. Working with convolutional, recurrent networks, signal processing library. It is a library and extension of Python language that allows scientists to calculate efficiently mathematical expressions. The library was named after the wife of ancient Greek mathematician Pythagoras - Theano. The library was developed for boosting a quick machine learning development. Theano contains compiler that converts mathematical expressions written in Python language to C or CUDA code. Can be easily edited using Python. All tools listed above make it possible to change your app drastically, integrating artificial intelligence into it. Our developers are always at your disposal to help you implement it. But what's special about AI and machine learning in particular? Why is it gaining its popularity so fast? What is the future of artificial intelligence? According to the latest forecasts of scientists, artificial intelligence can beat human's mind by the end of next decade, and it will be able to solve tasks that are well above the capacity of the mankind. However, if AI will be under control, it will serve to the well-being of people. If we speak about machine learning and deep learning, these technologies already assist us in our daily life. And future promises us that it is only the beginning. Figure out about the future impact of AI on the world economy. Read Artificial intelligence in business: impact and perspectives. So, summing up, we would like to note that we are looking forward to getting more orders related to AI integration into your software, so if you plan to implement something like this, you should contact us right now. And subscribe button on the right side will help you to stay always in touch with all the interesting news.